https://www.peppacny.com/synopsis/ This presentation is in Mandarin with English subtitles. Tang Yuan and Jiao Zi live happily with their mom and dad. On the morning of Chinese New Year’s Eve, the kids were excited to go to their grandpa and grandma’s home (dad’s side) but were surprised to see their parents were busy cleaning the house. Their parents forgot to tell them that their grandpa and grandma (mom’s side) would be coming over from the south to spend the Chinese New Year with them. To cheer up the kids, Dad told them a story about Peppa at a kid’s festival. Missing their grandkids so much, grandpa and grandma (dad’s side) cut short their vacation in Sanya and came back to the north. Their arrival added a lot of CNY festival mood to the family. Grandma told the kids about the unexpected happening during Peppa’s adventure on the 2nd day of the kid’s festival.. Together the family celebrated many Chinese traditional customs like hanging up the Chinese knot, paper cutting, sticking the spring festival scrolls and sending red packet etc. Like Peppa and George, they love family, life and each other more after each experience. Featuring brand new Peppa Pig episodes, as well as some fan favorites, Tang Yuan, Jiao Zi and their family enjoy the Chinese New Year together, learning about traditions, and sharing Peppa Pig stories along the way. 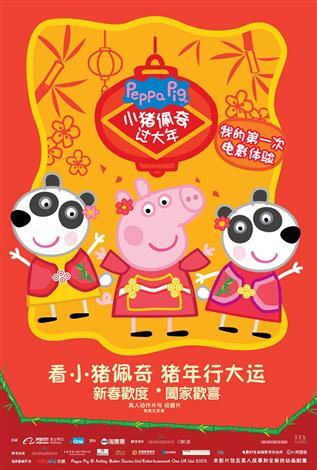 Please note: Peppa Celebrates Chinese New Year is in the Mandarin language with English subtitles.